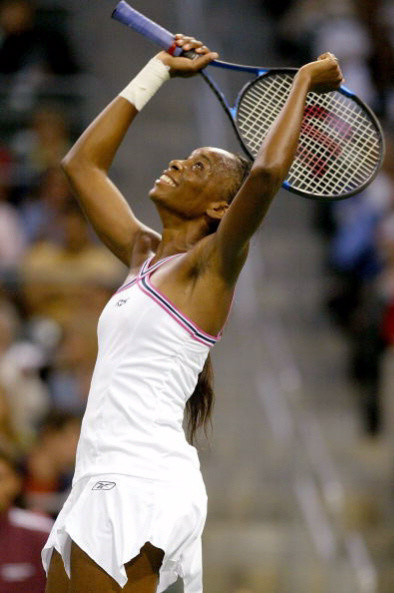 Venus Williams reacts to beating Elena Likhovtseva of Russia during the JP Morgan Chase Open on July 22, 2004 at the Home Depot Center in Carson, California. Williams won the match 6-1, 6-1. CARSON, California (Ticker) - Sisters Serena and Venus Williams proved they are at top of the class by schooling their opponents. Top-seeded Serena outclassed Arantxa Parra Santonja of Spain 6-3, 6-0, on Thursday to roll into the quarterfinals of the $585,000 JPMorgan Chase Open. "I felt comfortable out there and got into a groove," said Serena, who won the first nine games and cruised to victory in 53 minutes before a sparse crowd at the Home Depot Center. In the featured evening match, second-seeded Venus Williams did her sister five minutes better, blasting past Elena Likhotseva, 6-1, 6-1. She improved to 9-0 all-time against the Russian. "That was probably more in her mind, that she's probably thinking of all the matches," Venus said. "I didn't know the score." No. 3 seed and three-time champion Lindsay Davenport went Venus one better, making it a perfect 10 career victories over Amy Frazier as she smacked 10 aces in a 6-2, 6-4 victory. A two-time champion here, Serena Williams is rounding into form after failing to capture her third straight Wimbledon crown earlier this month, when the former world No. 1 was stunned by Russian teenage sensation Maria Sharapova. The Spaniard leveled the second set at 3-3 before Williams regained control and rolled to the victory. "She changed up her game a little bit and I had to adjust to the change," Williams said. "Once I was able to adjust, I was able get back in the groove and play better again." Although Davenport has been stretched to three sets just once by Frazier, the three-time champion of this event doesn't feel she owns the rivalry. "It's funny when you said that because I remember I played her a couple times but I had no idea it was up to nine or 10 times," Davenport said. "It's a pretty good record against someone, but maybe 'own' is pretty strong word." Still, Davenport respects the 14-year veteran, calling Frazier "old school." "It's a compliment, though," Davenport laughed. "She's a classic. I don't know what to say. She's been around and when introducing us, they said her best result in a Grand Slam was in '92." Elena Dementieva and Svetlana Kuznetsovsa also were victorious, setting up a quarterfinal clash of Russians on Friday. The fourth-seeded Dementieva outlasted 2002 champion Chanda Rubin of the United States, 7-5, 7-6 (10-8). Earlier, the fifth-seeded Kuznetsova outclassed No. 10 Anna Smashnova-Pistolesi of Israel, 6-3, 6-0. Also advancing to the quarters were No. 7 Nadia Petrova and No. 8 Vera Zvonareva. Petrova dismissed Croatia's Jelena Kostanic, 6-3, 6-3 and will face Davenport. Zvonareva eliminated Marion Bartoli of France, 6-2, 6-3, and will face Serena Williams. No. 11 Francesca Schiavone of Italy engineered a minor upset with a 6-3, 0-6, 7-6 (7-3) win over No. 6 Ai Sugiyama of Japan. Dementieva offset a soft serve with searing groundstrokes to win for the fifth time in seven career meetings against the 14th-seeded Rubin. "It was difficult match," said Dementieva, runner-up at the French Open to Anastasia Myskina in the first All-Russian Grand Slam final. "I realize how much she wants to beat me. Every time I play Chanda, I have to be very focused on the court because she has a big motivation against me."